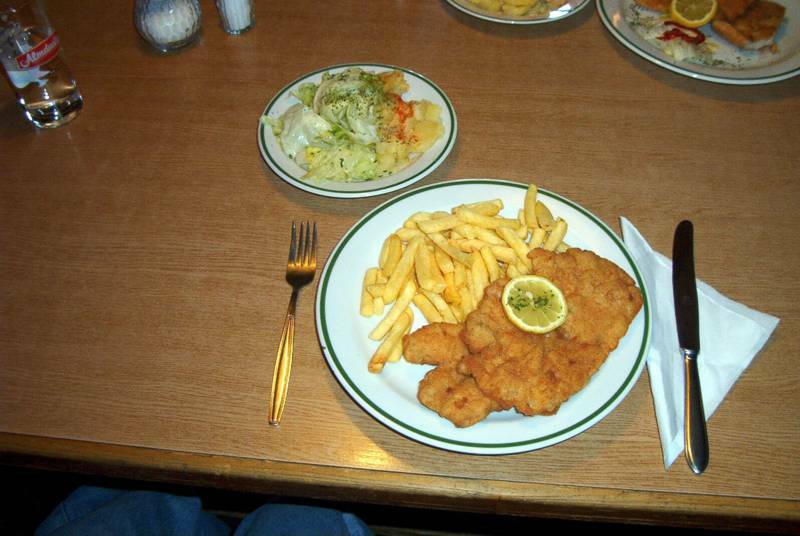 Though I’m extremely fond of it, I don’t tend to eat a lot of German food at home. Traditional German food - like the traditional food of most European countries, I reckon - tends to be a bit more meat-centric, labor-intensive and fat-laden than I generally like my everyday food to be. That said, I would give my right arm for a proper SchniPoSa from the Gruenhof restaurant in Freiburg: a schnitzel as big as your head, coated in seasoned breadcrumbs and fried to crispy golden perfection, served up with a bit of rich, dark gravy, a mountain of slender French fries (for soaking up the gravy), and a massive mixed salad consisting of the ubiquitous grated carrots, grated radishes, sliced cucumbers, German potato salad, and lettuce dressed with That German Salad Dressing (which I have yet to be able to replicate at home). All of this would, of course, be washed down with the fresh, frosty beer of your choice. And dessert is out of the question. Anyway, I was cooking for one tonight, so I figured it would be a good evening to try to clear out some of the odds and ends that have taken over our fridge. As luck would have it, those odds and ends included a lone sausage, some orphaned potatoes, and a huge jar of sauerkraut - bingo! Germany called, and I responded by heating up the sauerkraut with a splash of white wine, a bay leaf and some juniper berries, making a bit of Swabian potato salad (the mayo-free kind), and serving it together with the sausage and a big dollop of spicy mustard. Simple fare, yes, but the type of food that is so strongly associated with a particular place in the world that just one little taste takes you back there in an instant. It was heavenly. 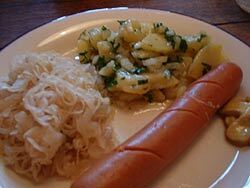 I may have broken with German tradition by serving that sauerkraut, however. Several years ago, Jeremy and I managed to shock some German friends of ours by suggesting that frankfurters and sauerkraut were a pretty tasty combination. Despite repeated assurances that there was nothing better than a "hot dog" smothered with sauerkraut, onions, mustard and ketchup, these friends insisted that there were certain things that people ate with sauerkraut - ham, for instance, or various other smoked pork products - but frankfurters were definitely not one of them. No matter how yummy they tasted. That looks SO GOOOOD….and by the by….HAPPY BIRTHDAY TO YOU!!!! Auch aus Emmendingen alles Gute zum Geburtstag! Wir waren übrigens jetzt in England und schwärmen zB von Scones und clotted cream (mehr als von SchniPoSa, da wir 2 Kinder haben, die kaum was anderes essen wollen).